The right upper button is the start/stop button; the right lower button is the reset button. The wind up crown is located in the centre (usually to the right; with automatic Heuer and Breitling chronographs, the wind up crown is to the left). 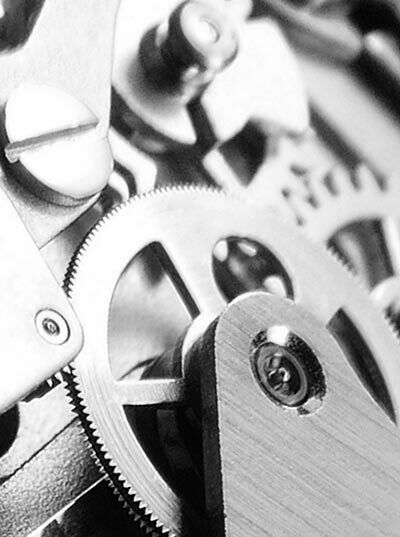 Operating the chronograph function: Press the start button – the stopwatch runs. Press the start button again – the stopwatch stops. You can now read out the time measured. 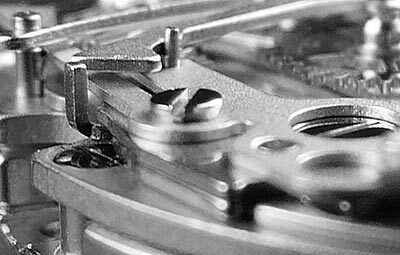 Depending on the clockwork, the chronograph has one to three sub-registers: The stopwatch seconds indicator shows the seconds measured; the stopwatch minute indicator shows the minutes measured; and the stopwatch hour indicator shows the hours measured (up to 12 hours). After reading out, press the reset button; all stopwatch indicators will go back to “0”. Particularities of calibre 15 chronographs: The stopwatch minute indicator shows the minutes measured up to 30 minutes. In addition, at 10:00, there is a continuously running seconds indicator. 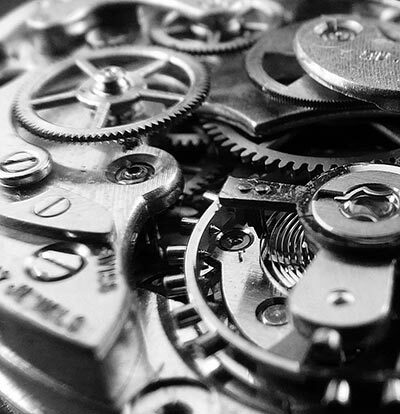 A mechanical watch is always less precise than a quartz watch. A mechanical watch has a disturbance. This oscillates at a particular heartbeat, which is between 18,000 A/h and 32,000 A/h. Even an absolutely perfectly regulated watch can become imprecise. The reason for this is physical influences, such as temperature and wearing habits. In order to perfectly regulate a watch, it would have to be adapted perfectly to the wearing behaviour of the owner, because already the temperature and the heating force of the earth are enough to make it tick a little slower or a little faster. Temperature fluctuations influence the running of the watch. A one-time and constant temperature change of 5° C is sufficient to make the mechanical watch run a minute faster or slower. Most watches are, however, subjected to multiple large temperature fluctuations daily, and still run with precision. Why? Because they are designed in such a way that these influences are either automatically compensated for or are completely excluded. This allows for various metals and compositions due to the temperature behaviour. The high-quality oil at the bearing positions can be chemically altered by the effects of heat. This can cause the lubricating qualities to decline, which means the running precision and running duration can worsen. Therefore, we strongly advise you not to wear the watch in the sauna. Tests have shown that repeated jolts in a vertical direction can lead to damage to the small gears, bearings and springs long-term. A mechanical armband watch is a precision instrument. When it is manufactured, tolerances of hundreths and thousandths of millimetres are worked with. Extreme, repeated shaking can have a negative effect on the running of the clockwork. This strain can occur when mountain biking and playing tennis or squash, for example; in other words, in types of sports in which the wrist joint makes constant backward movements. You can influence the running precision of your mechanical watch yourself to a certain degree. If you take the watch off at night, you can place it in different positions. CROWN POINTING UP: The watch will run slower, because the balance wheel is in a suspended position and the resistance is greater. FACE POINTING DOWN: The watch will run faster, because the lowest amount of friction occurs here. Observe the gear behaviour of your watch for awhile and try out the different positions (as well as CROWN POINTING DOWN and FACE POINTING UP); in this way, walking abnormalities of 2 to 3 seconds per day are possible.